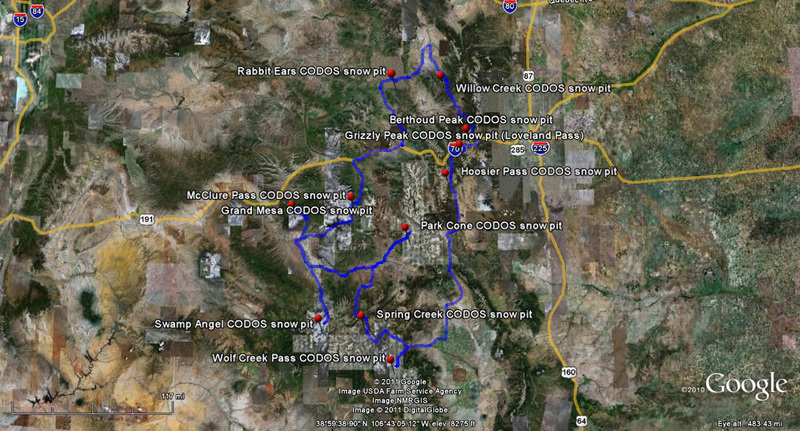 With direct funding support from stakeholders, CODOS monitors the presence/absence of dust layers at 11 mountain pass locations throughout Colorado. With those data, data from nearby Snotel sites, and weather forecasts, CODOS provides its funders with a series of “Update” analyses of how dust-on-snow is likely to influence snowmelt timing and rates during the snowmelt runoff season. The Center for Snow & Avalanche Studies serves the mountain science community and regional resource managers by hosting & conducting interdisciplinary research and conducting integrative 24/7/365 monitoring that captures weather, snowpack, radiation, soils, plant community and hydrologic signals of regional climate trends. Although parts of Colorado have fared slightly better from fall storms, the western San Juan Mountains remain bare on south, east, and west aspects, and just a few inches of snow persist on north aspects. Silverton saw some snow flurries in October but there's no snow at all left around town today, and very little to be seen on the peaks around town either. At Senator Beck Basin, we logged only 1.26" of precipitation at the Swamp Angel Study Plot in October, about 32% of our own period of record (2004-2012) October average of 3.96" of precipitation. That precipitation was split about 50/50 between rain and snow at Swamp Angel (11,060'), a typical ratio for us in October, and the ground is currently bare at both the Swamp Angel and the alpine Senator Beck (12,080') Study Plots. So far this Water Year, we've seen only five days with any measurable precipitation at Swamp Angel (one of those produced just 1 mm of water) and no "numbered" winter storms containing at least 0.5" of water equivalent, as snow that 'stuck' over 50% of the basin and/or our plots. Last winter, we had logged three "numbered" winter storms at Senator Beck Basin by the end of October and two more in early November, with Storm #5 on Nov 4th and 5th (2011). We post that storm data on our website at http://snowstudies.org/storms.html. As you may have seen, the NOAA Climate Prediction Center precipitation probability outlook for our mountains in November remains ambivalent ... Colorado remains in the "equal chances" of above average or below average precipitation. Looking farther ahead, Colorado remains in the "EC" zone for the entire winter in their monthly outlooks for precipitation. We're also consistently shown in an area with a increased probability of warmer than normal temperatures. Meanwhile, NOAA/NCEP (as of October 29) continues to describe ENSO as neutral, bordering on a weak El Niño condition warranting an "El Niño Watch". Joe Ramey, a staff meteorologist from the National Weather Service in Grand Junction, described this as a "No Niño" condition at the Colorado Snow and Avalanche Workshop in Leadville on October 19th, and discussed the mixed record of such winters in Colorado. No Niño's apparently show some tendency to favor the northern mountains with precipitation in mid-winter and the southern mountains late in the winter and spring ... but only slight tendencies. For truly die-hard weather enthusiasts, meteorologist Larry Cosgrove, in Houston, publishes detailed weekly newsletters (distributed by email) evaluating conditions on a global scale, issuing mid- and long-term forecasts for the US, by region. You can subscribe to his (copyrighted) newsletter from his Houston Examiner website at: http://www.examiner.com/weather-in-houston/larry-cosgrove. As of this (Sunday) morning, the GFS model described above shows a storm headed for Colorado, beginning Friday, that could deliver upwards of 0.7" of water equivalent by next Sunday morning. If that materializes, this could be our first "numbered" winter storm of the season and Senator Beck basin ... TBD.